See scan - perfect condition. This is a nice and rare vintage turn of century / 1920s sterling silver cigarette case presented to a Greece / Greek merchant. 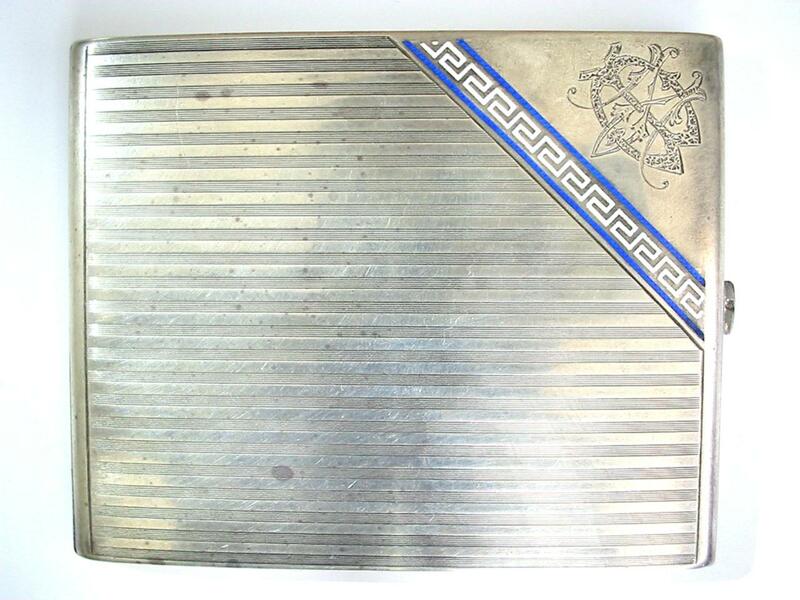 The case has a plain silver back and front lid is nicely engraved with tiny stripes plus having a perfect looking ancient Greek motif in white and blue enamel towards one of the corners. Ther is also a nicely engraved 2 letter monogram cypher that could read either 'MB' or 'BM'. The case is hallmarked for 800 silver and most likely was manufactured in Germany or Austria. The cigarette case measures 102mm x 81mm and weighs approximately 142 grams of silver. 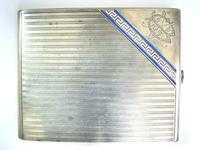 Nice tobacco and cigarettes related collector piece and one of the nice and rare Greece / Greek silver cigarette cases.